CATALINA ISLAND — For more than two weeks Capt. Nicole Stockham has overseen a company of Marines and more than a dozen Navy Seabees tasked with rebuilding a decaying, 77-year-old runway at Channel Island’s Airport in the Sky. The Marines and Seabees are living in tents near the airport nestled in the hilly interior high on the island. The only access is a winding narrow road bordered in places by eucalyptus trees that act as barriers to steep drop-offs. There are dramatic views of the town of Avalon, which draws 1 million tourists annually, and the Pacific Ocean. Each day about 100 Marines — combat engineers, heavy equipment operators and surveyors — start at sunrise, go to a briefing, grab chow and get to work on the 3,000-foot runway. Their mission: to build a new runway guaranteed to last at least 70 years. The project is expected to be completed by the end of March. “I’m very happy and proud of the Marines and what they’re doing,” said Stockham. The Marine and Navy encampment is similar to an operating base typically used during worldwide deployments or on humanitarian aid missions. Tents are filled with cots, there’s a chow hall, there are power generators, maintenance facilities and communication systems. 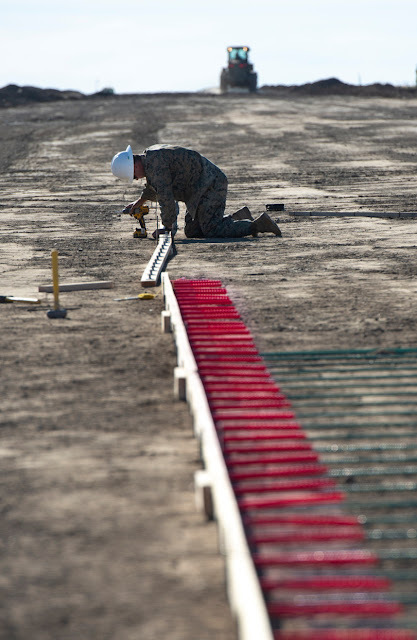 Since early January, about 100 Marines and 14 sailors (Seabees) have worked on the runway. They have excavated earth, surveyed the site and prepared forms for concrete-pouring. 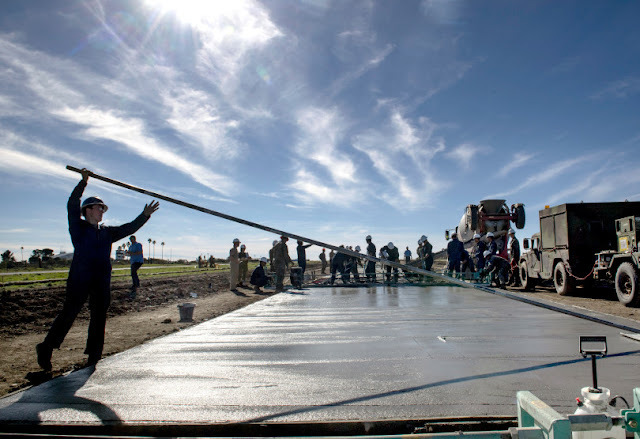 By Friday, Jan. 25, five large concrete slabs had been poured, with 119 more to go. The effort by the Marines and Seabees is a first in California and critical to Catalina Island and its public airport. 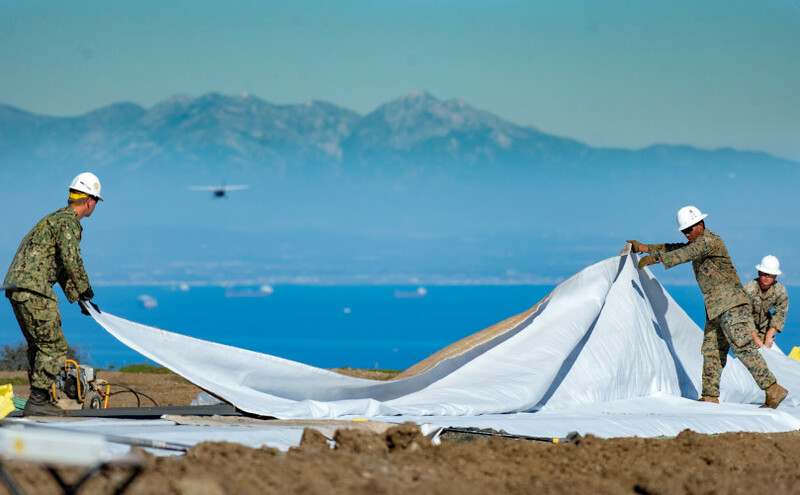 The runway project, a public/private partnership between the Marines Corps, the U.S. Navy and the Catalina Island Conservancy, is a win-win. The $5 million project began with 500 tons of equipment being delivered in mid-December and troops coming over on Jan. 2. The program is part of the Department of Defense’s Innovative Readiness Training Program and matches community needs with military training opportunities. For the conservancy, one of the state’s oldest land trusts, the project saves the island’s runway. Over the years, it has required frequent patching costing the conservancy about $250,000 a year. In September, the California Department of Transportation’s Aeronautics Division told the conservancy that it needed a long-term repair plan to continue to operate the airport as a public airport. 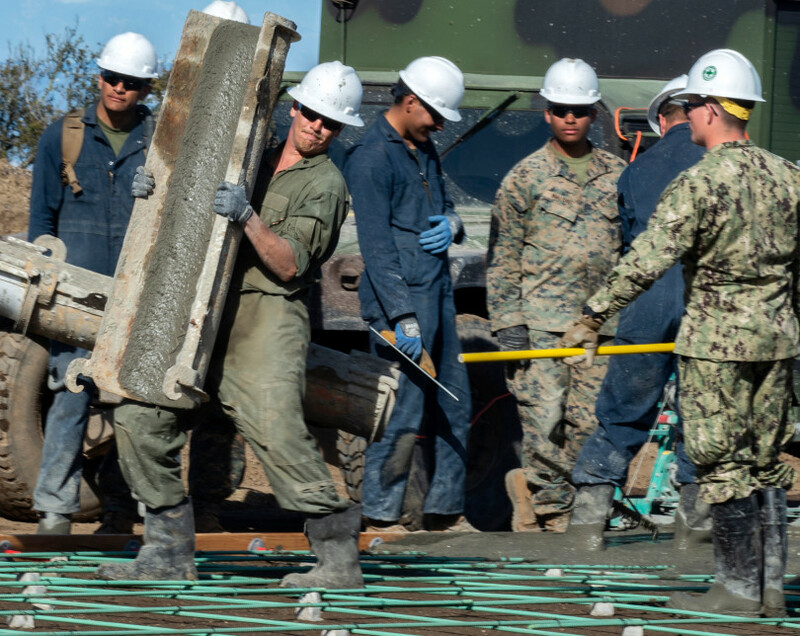 For the Marine Corps, officials say the partnership provides a unique opportunity to plan, train and deploy Marines to execute a construction mission that tests critical skills. The Marines, expert at working with concrete, are being supported by the Navy Seabees, who typically are tasked with construction work such as facilities, schools, hospitals and on bases. 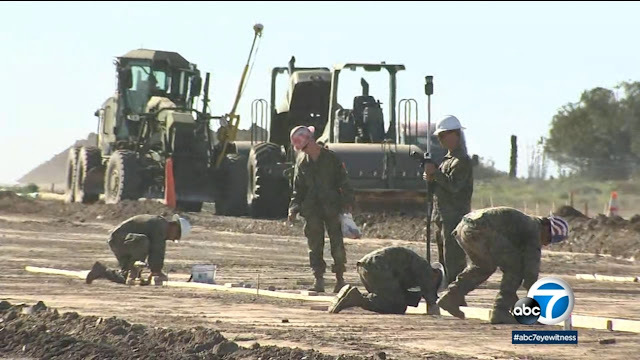 Some Marines involved in the project will go on to construction projects at 29 Palms or overseas. These expeditionary runways typically include leveling dirt and laying interlocking metal planks. The runways and airfields are temporary. “We looked at this project and our experiences in Iraq and Afghanistan and realized we need more experience with concrete to support Marine aviation,” Bauch added. The project is also providing an opportunity for the Marines and Seabees to collaborate using their various specialties. Catalina’s airport was built in 1941 by William Wrigley. It was carved out of the surrounding landscape by leveling two mountaintops and filling in the remaining canyon to create the main runway. The airport got its name from its location as one of Catalina’s highest points, an elevation of 1,602 feet. During World War II, the airfield and the island were leased to the U.S. government to serve as a front line in the defense of the nation’s West Coast. The Office of Strategic Services, a forerunner to today’s CIA, used the island as a secret training base for intelligence agents, and the airport’s runway was covered with debris so enemy aircraft would not be able to use it as a base. After the war, the airport was opened for public access in 1946. The conservancy took ownership and responsibility for the airport’s operations in 1972, and has managed it as a general aviation airport, said Tony Budrovich, Catalina Island Conservancy president and CEO. More than 7,000 flights come into the airport each year, about 30 percent of those providing mail service and FedEx and UPS deliveries to the island’s 4,000 year-round residents. The island also is a popular tourist spot. Officials closed the main runway on Monday, Dec. 10. Only a limited number of flights are allowed to land on an alternate runway. The joint rebuild project began more than two years ago with an idea from a Navy pilot, who was flying his own aircraft on his day off and landed at the airport. The conservancy talked to the U.S. Navy and the Marine Corps about the project and for the next 18 months, the conservancy worked with the Office of the Assistant Secretary of Defense, Navy personnel and the I Marine Expeditionary Force to develop the plan. “They loved what they’re getting and we loved what we’re getting,” Budrovich said. Navy Seabee Lt. Michael Brown, a Navy reservist, was overseeing the Marines’ work on Friday. “When you go overseas, it’s harder to get resources,” he said, explaining the 500 tons of equipment, trucks and supplies that traveled from Miramar by caravan to the Port of Los Angeles and then over to Two Harbors, from where they were trucked up the steep and narrow winding roadway. “On an island, it’s much more limited and mimics environments that are not here in the U.S,” he said. Brown, who works as a mechanical engineer for Siemens in Allegany, N.Y., explained that he and other Seabees, familiar with construction, are helping the Marines who are not as familiar with the scale of this project. Recent rain, along with cold temperatures and fog have made the work more challenging. He also got a chance to take in a bit of the island, including visits to Avalon where he checked out shops, the museum and the casino. While there he also met locals. “It’s been amazing how when we’re walking around they come right up to us and thank us and are appreciative of what we’ve been doing,” Brown said. For Stockham, who has deployed to Afghanistan, the project has been a valuable tool to teach her Marines about future deployments. This deployment, she said, ranks among the best she’s experienced. CATALINA, California (KABC) -- U.S. Marines and Navy Seabees have taken over the Airport in the Sky on Catalina Island, living on the grounds for three-and-a-half months. They're not training for combat, but instead rebuilding the runway. "This is a great opportunity for the Marines. We're used to working on expeditionary runways, filling potholes of that nature. We're creating a 3,000-foot-long runway, 60 feet wide, 5 inches deep. When you look at situations around the world like the earthquake in Haiti, the tsunami that wiped out the runway, it's an opportunity for Marines to get better at flexing our humanitarian muscle," said Zachary Bodner, a Marine working on the Catalina runway project. The project is also a huge win for the airport's aging runway. The Airport in the Sky is an important part of Catalina's infrastructure, supporting the 4,000 full-time residents, 1 million visitors, and 2 million pounds of freight that pass through. The runway sees 14,000 takeoffs and landings a year. "We found that they had a unique need. They needed to have practice and experience building a runway which they had not done since the '60s in a complete form and we had a need to rebuild our runway," said Tony Budrovich, the president and CEO of the Catalina Island Conservancy. Budrovich says all of the island's mail and overnight deliveries pass through the airport. The new runway is expected to last up to 75 years. "When the Marines got involved, we narrowed this project to a 3.5-month project. When we were talking to outside contractors we were talking a year so we're very proud of this relationship we have working with the Marines and Navy Seabees and the efficiency with which they can do work," said Budrovich. While the project is underway, the runway is only open to commercial aircraft. Private aircraft will be able to land again on Catalina in April.